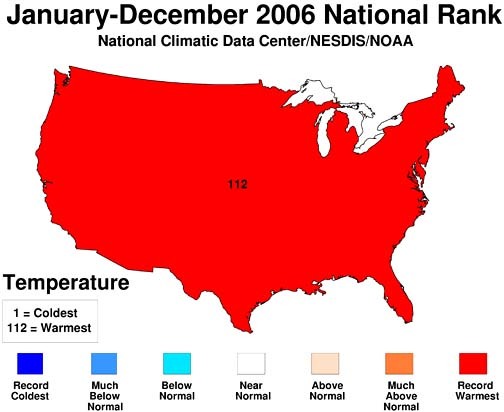 January 10, 2007 Asheville, North Carolina – NOAA’s National Climate Data Center in Asheville, North Carolina, reports that 2006 was the warmest year on record for the United States. The 2006 average annual temperature for the contiguous U.S. was slightly higher than the record set in 1998. Seven months in 2006 were much warmer than average, including December, which ended as the fourth warmest December since records began in 1895 and the hottest December in the history of Minnesota, New York, Connecticut, Vermont, and New Hampshire. Based on preliminary data, the 2006 annual average temperature was 55 degrees, which was 2.2 degrees Fahrenheit (1.2 degrees Celsius) above the 20th Century mean and 0.07 degrees F. (0.04 degrees C.) warmer than 1998. These values were calculated using a network of more than 1,200 U.S. Historical Climatology Network stations. These data, primarily from rural stations, have been adjusted to remove artificial effects resulting from factors such as urbanization and station and instrument changes, which occurred during the period of record. After a cold start to December, the persistence of spring-like temperatures in the eastern two-thirds of the country during the final two to three weeks of 2006 made this the fourth warmest December on record in the U.S., and helped bring the annual average to record high levels. For example, the monthly average temperature in Boston was 8 degrees F. above average, and in Minneapolis-St Paul, the temperature was 17 degrees F. above average for the last three weeks of December. Even in Denver, which had its third snowiest December on record and endured a major blizzard that brought the city to a standstill during the holiday travel season, the temperature for the month was 1.4 degrees F warmer than the 1971-2000 average. The unusually warm start to this winter reflected the rarity of Arctic outbreaks across the country as an El Niño episode continued in the equatorial Pacific. A contributing factor to the unusually warm temperatures throughout 2006 also is the long-term warming trend, which has been linked to increases in greenhouse gases. This has made warmer-than-average conditions more common in the U.S. and other parts of the world. It is unclear how much of the recent anomalous warmth was due to greenhouse-gas-induced warming and how much was due to the El Niño-related circulation pattern. It is known that El Niño is playing a major role in this winter’s short-term warm period. U.S. and global annual temperatures are now approximately 1.0 degrees F. warmer than at the start of the 20th century, and the rate of warming has accelerated over the past 30 years, increasing globally since the mid-1970s at a rate approximately three times faster than the century-scale trend. The past nine years have all been among the 25 warmest years on record for the contiguous U.S., unprecedented in the historical record. 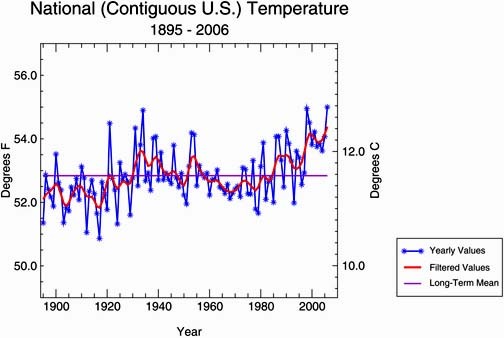 National temperatures for the contiguous United States measured for 111 years from 1895 to 2006. Graph courtsey NOAA. For further information about global warming, please see the Earthfiles Archives below. 11/09/2006 — Outer Space Sunshade to Cool Earth in Global Warming? Next PostNext Confusing Sun: Will Solar Cycle 24 Be Most Intense On Record?